The first springer of the year is usually the hardest. This year was no exception and indeed, the effects of Storm Frank which hit Deeside so badly on 30th December made it more so than usual. My season always starts with opening day on the Tummel on 15th January. If nothing else, you meet friends and blow the cobwebs away. This winter has seen so much rainfall that the Tummel was virtually unfishable in January. 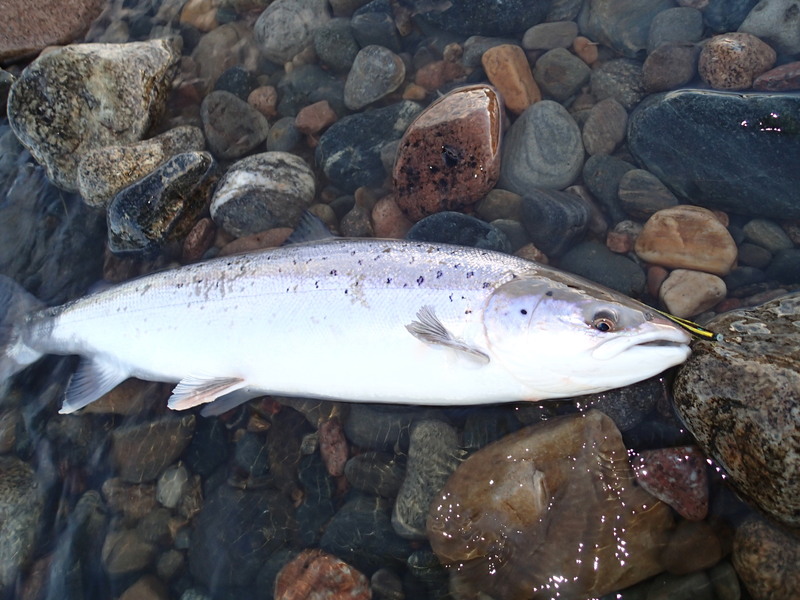 My first real chance of a springer therefore came this season on my Ballogie days on the Dee which this year fell on 8th to 10th February. I always look forward to this trip. There is nothing quite like finding a beautiful shining bright springer in the adverse weather conditions which often prevail in February. They are hard won but what a reward if you are fortunate enough to land one! I had heard of the massive damage on Deeside caused by Storm Frank and witnessed the news coverage showing static caravans and fishing huts sailing down the swollen river. The image of Abergeldy Castle teetering over the eroded river bank is unforgettable. Yet I was not ready for the sight of the damage to my favourite pool on the Upper Beat of Ballogie called “The Slips” The current sweeps round a bend in a pool called “the Sands” into the Slips and the flood has ripped away the banking on the Ballogie side and created a deep unwadeable channel near the side. The Slips was always a tricky marginal wade (although a very productive one) but it is now impossible at spring water levels. Heartbreaking. It is perhaps too early to judge the effects on other parts of the beat. There was no real stock of fish evident (kelts or springers) to indicate where the fish may lie. As it was, fishing conditions were as near perfect as you are likely to encounter in February. Settled weather with benign winds and a falling river from 2ft 5″ on Monday to 2ft 1″ on Wednesday. It became evident however that there were very few fish around reinforced by the scant returns posted on FishDee. In such circumstances it is easy for the shoulders to slump and enthusiasm to wane. As if on cue, the other rods in my party started to quietly leave the river after lunch on the Wednesday thinking more of the journey home than the remote chance of a springer. As for me, I was in no hurry and as I was drawn to fish the lower part of the beat which contains some of my favourite casts, I resolved to fish on till last light. I didn’t have to wait that long. At 3.30pm fishing the Bulwarks Pool I had that slow draw and delicious pull that every salmon fisher lives for. Your immediate thought is that it might be a kelt but when the fish took a strong run upstream followed by an energetic leap, I knew I was in business. Not one of my bigger springers but beautifully fresh and prized beyond measure. My season has begun! The fish was kept in the water, unhooked and swam away strongly. For anyone interested in the setup, I was using the rig which has often performed well for me in the spring, a Rio AFS Hover Shooting Head + 14ft Type 3 tip with a 1.25″ Black & Yellow brass tube. Footnote: despite the carnage which Storm Frank brought to the Dee and the unavoidable loss of redds and juvenile stock, nature has a funny way of bouncing back and I sincerely hope and pray that the river will thrive in years to come.